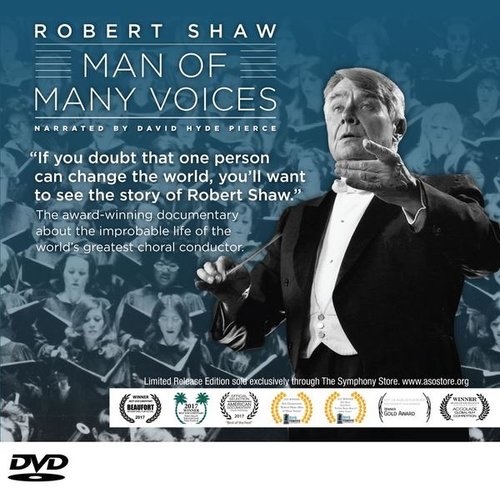 "Robert Shaw - Man of Many Voices"
The Robert Shaw Man of Many Voices DVD is not available for purchase at this time while producers are in negotiations that may involve a distribution component. We will keep you posted as we receive new information. For those who knew him, Robert Shaw was a fascinating but enigmatic blend of personal charisma and utter modesty. His lifelong devotion to his art was sustained with complete lack of hubris, yet to those who worked with him he seemed to possess an extraordinary power to draw from them the best that they could give him. Though he sometimes professed to being a religious agnostic, he never forgot or rejected the evangelical faith and music in which he was immersed during his formative years. His career was largely based on the great musical masterpieces of the Christian faith, and he approached them with a sense of awe and total devotion. His intensity in preparing performances of these and other works was legendary: no matter how many times he had conducted one of the mainstays of his repertory, each new set of performances occasioned a complete re-study of the score and revision of his editorial markings. Shaw’s personal modesty did not keep him from realizing his own strengths: he seems to have known that he had something special to bring to his art, and this knowledge inspired him to become an innovator and proponent of the choral art in a way probably never previously seen in western music. In rehearsals he could be by turns humorous to the point of ribaldry or demanding to the point of upbraiding his chorus for not caring about their musical execution. The result was that choruses tended to be mesmerized by him; and from that, together with his extraordinary technical facility and unparalleled work ethic, he created choral experiences which exalted his singers no less than his audiences.